Lately i have become found of what i have affectionately named, ‘The Power Blouse’. And what is a ‘Power Blouse’ i hear you ask. Well, lately i have been finding the simplistic outfits the best outfits. Take a beautiful blouse for instance, it is the easiest thing to just throw on and go and feel pretty good about it too. 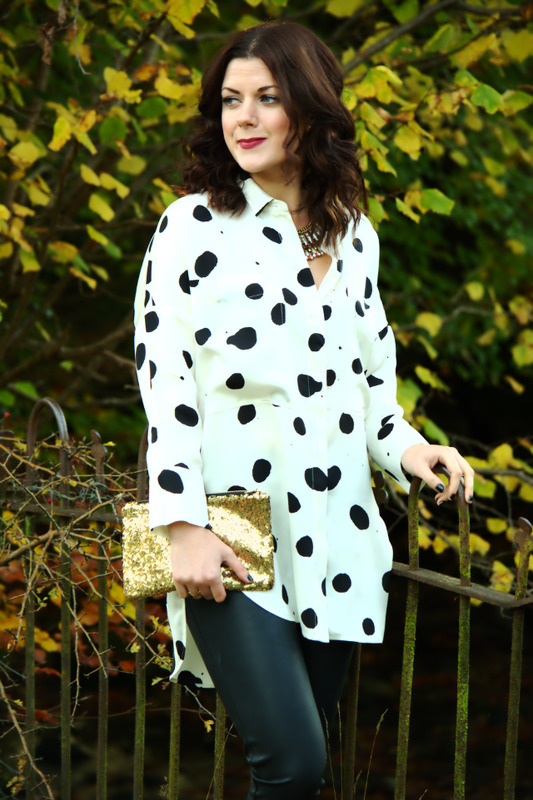 Great for the office, day-wear or a night out, a workhorse of a blouse is why i’ve aptly named it ‘The Power Blouse’. And there’s nothing like pairing your Power Blouse with a pair of faux leather trousers for added sass. Another current favourite. I picked up this shirt when there were discount codes flying around, i kinda just fell for its dalmatian-esque print, which falls nicely in to my monochromatic love of late. I added in a little sparkle with my favourite clutch and necklace, some berry coloured heels and lipstick and it was easy-peasy dressing. Do you own any ‘Power Blouses’? 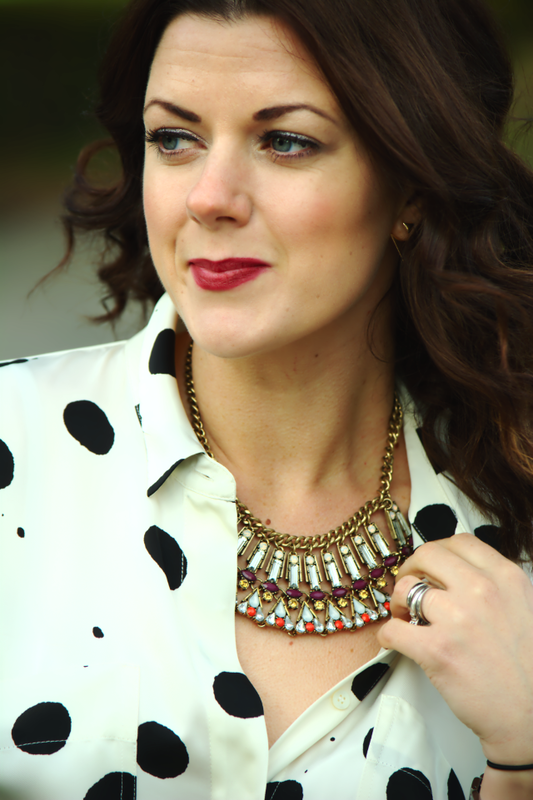 I agree that shirts are great go-to options that can work for so many occasions! I love these friday link-ups. I love looking at everyone's style! Hi Rachel! I've been looking forward to your link up all week! I'm not kidding. I had just a weird one. I couldn't find my groove all week long. Posting was slow, so I didn't have anything to link up until today. I hope you don't mind that I linked up four posts: three collabs with a theme and one DIY. Anyway, my family all returns to town today. I think I was thrown for a loop being solo. School trips were this past week. Anyway, on to you and this fabulous outfit! I love the polka dots. I have a similar top but my dots are smaller. I also really like your faux leggings–perfectly tight! I can't find mine, soooo, I'm off to remedy that. Thanks for the link up Rachel. I'm serious. I've been looking forward to it all week long! That shirt! What a great buy. I love love love monochrome , especially with a pop of colour. The heels are perfect! Great outfit! Loveeeeee those shoes so much! What a great pop of color! Have a fantastic weekend (you "doing" Halloween?) – thank you for hosting, oh gorgeous one! Love everything about this look!!! 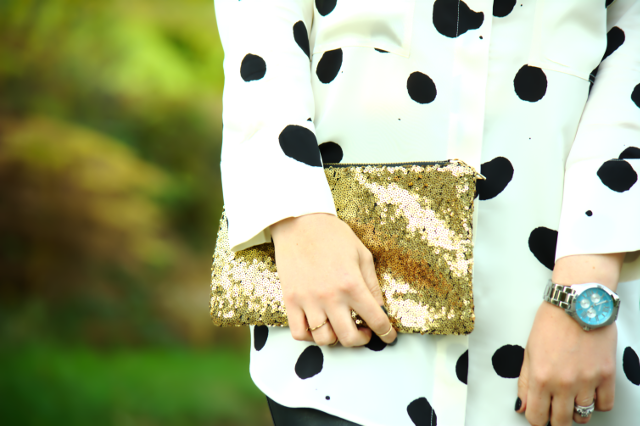 Especially the gold clutch and the polka dots!!! Love that bold top! The red pumps are a nice touch. This shirt is so bold and beautiful, and I love the gold clutch! Rachel – wowzers! That is one heck of a power blouse. You look stunning and I love the red shoes and sparkly clutch with it too. 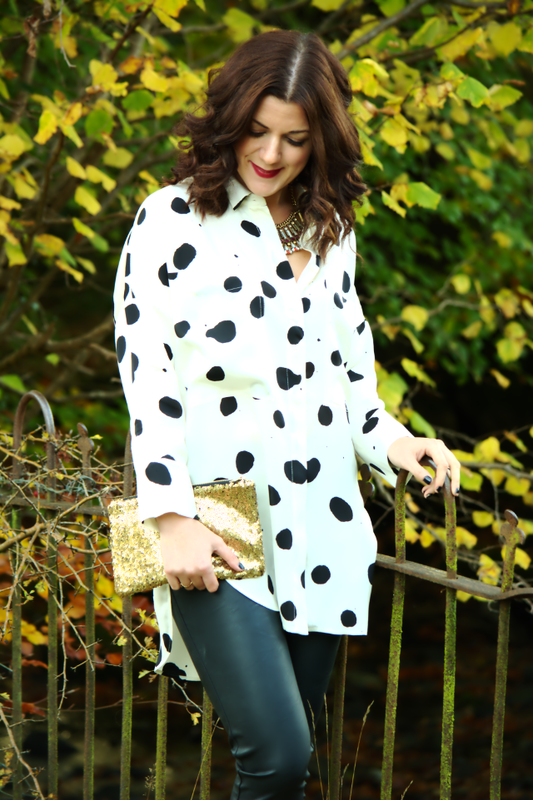 The dalmation blouse is a complete showstopper! And I love the name – power blouse. I'm going to have to get me some power blouses! Loving your power blouse and how your paired it with the leather pants. Beautiful look. I love tops that do that, that are almost a basic or go-to. Looking lovely! You look incredible here, I wish I could steal this whole outfit off you!